An Updated Listing of City Projects. Below, please find an updated listing of many of the completed, current, upcoming, and ongoing projects throughout the City of San Fernando along with contact information for the department that oversees each project. Installation of a new gas main by the Gas Company that will supply natural gas to the fueling station. It is expected that full design will get underway in late February and take approximately 3 months to complete. Once designs are approved by the City, we will move forward with ordering equipment and materials. We will be sure to keep you informed as this project moves forward and will also be sure to provide adequate notice to the public prior to starting construction. 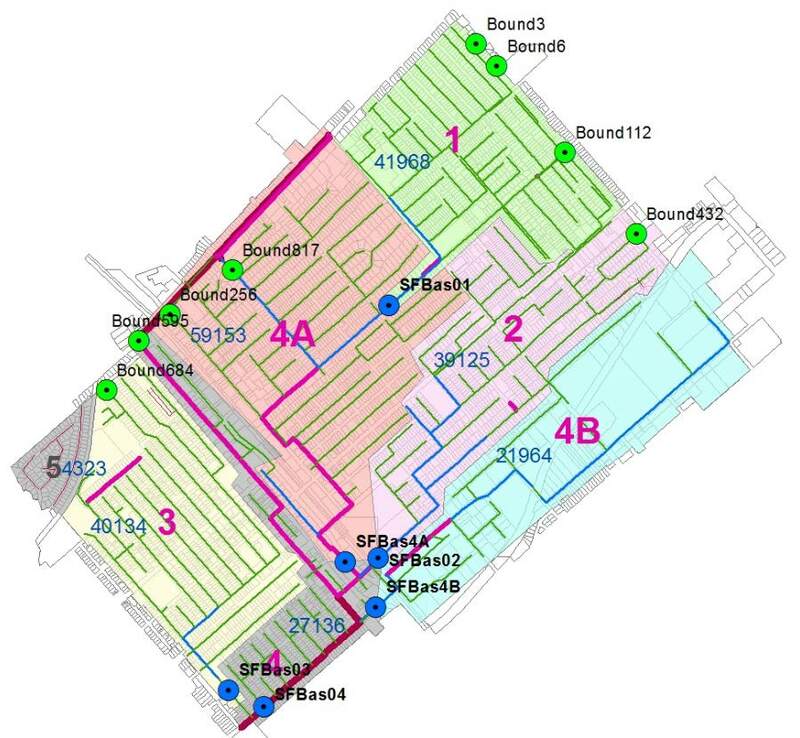 The City in collaboration with the Southern California Association of Governments (SCAG) and California State University’s Center for Geographical Studies (CGS), have been working to digitize and map City infrastructure and land uses. Using Geographic Information Systems (GIS) software, hardware and interns provided by SCAG that work in collaboration with faculty and students at CSUN, the City is working with these partners to identify and track existing sewer, water, street trees, light poles, and traffic light infrastructure in an effort to facilitate City staff’s ongoing access and maintenance. In addition, the GIS Program also facilitated the update of the City’s zoning and land use maps and will eventually lead to a publicly accessible web-based interactive maps and search of City GIS data. The new City website has improved the ease of access of the community to city information across various social media outlets and mobile device platforms. You can now search the City website from your computer, phone and/or tablet for the next City Council or Commission meeting, search the City budget and City expenditures in real time, find out what new projects are being considered in town, visit the City’s new Economic Development web pages, and finding out what recreational activities and special event are available for you and your family to enjoy and participate. One of the main goals of the updated website is to improve the ease of access for residents, property owners, and the business community to needed public information and enhance community knowledge and engagement in the City efforts to improve the community. The men and women of the Police Department are dedicated professionals vested in the highest quality of life for the community. To this end, the Police Department couples it’s three-minute average response time with its emphasis on community policing and Neighborhood Watch Program as it works collaboratively with residents and businesses to continue to make the City a safe and enjoyable place to live, work, and visit. If you are interested in participating in the Police Department’s community policing efforts and/or Neighborhood Watch meetings, please contact the Police Department. On January 3, 2017, the Planning and Preservation Commission unanimously approved Conditional Use Permit (CUP) 2016-008 to allow the development of a new CVS Pharmacy Store in the downtown area. The new retail drug store will occupy an approximate 13,275 square-foot commercial building at the corner of San Fernando Road and San Fernando Mission Boulevard. The CVS Pharmacy is currently slated for opening in April of 2018. Metro and the Federal Transit Administration (FTA), in coordination with the Cities of Los Angeles and San Fernando, are evaluating the feasibility of a major mass transit project that would operate in the center or curb-lane along Van Nuys Boulevard from the Van Nuys Metro Orange Line to San Fernando Road. From there the proposed alignment of the East San Fernando Valley Transit Corridor Project would proceed northwest along San Fernando Road to the Sylmar/San Fernando Metrolink Station – a distance of 9.2 miles. As part the project alternatives, the City may see the development of a bus rapid transit line or a light rail transit line, which includes a light rail tram option and a possible second transit station in or adjacent to the City’s downtown area. $170 million were originally identified for project funding in 2008 as a result of the passage of Measure R (i.e., the half-cent sales tax approved by Los Angeles County voters in 2008); a new total budget of $1.3 million is now going to be potentially available as a result of the recent passage of Measure M by County voters in 2016. Currently, there are two alternatives for dedicated bus rapid transit service and two for light rail service, along with the federal and state required “no build” and “transportation systems management” alternatives. Public participation has been a critical part of the study process and as such, Metro has hosted numerous community meetings to update residents, businesses, elected officials and stakeholders on the study progress and to encourage input on the refined alternatives. All potential alternatives are being studied as part of an Environmental Impact Statement (EIS)/Environmental Impact Report (EIR) as required by federal and state laws. It is anticipated that the public review period for the EIS/EIR and associated public meetings will start up in the second to third quarter of 2017. Development of an Implementation and Control Program: Establish implementation and control program to evaluate efficiency and success of program with specific economic indicators. The RED Team to assist prospective businesses with navigating the permitting and entitlement process and meet with existing businesses to address current and future needs. The RED team includes the City Manager, the Community Development Director, and the Mayor. Based on the level of need, staff is also exploring partnership opportunities with representatives from the Chamber of Commerce, LAEDC, and VEA to assist the City with efforts to keep and attract new business to the City. These efforts have led to new businesses making their home in the City (Modern Props, CVS Pharmacy Store, Chipotle, Wingstop, Yogurtland, La Manzanita, La Michoacán, Throwback Junction, and The Industrial Shoe Store) and the expansion of local businesses such as Magaly’s Tamales and Papa Juan’s restaurants. Completed. The Community Development Director in conjunction with existing department personnel are the primary point of contact for prospective business, real estate agents seeking new commercial business sites, and outreach to potential businesses that are currently looking for sites to expand their corporate brand. Completed. The redesigned City website and an economic development specific webpage within the Community Development Department is now live. Currently underway. City staff is working with the Valley Economic Alliance to put the final touches on the report, which should be presented to City Council in the second quarter of 2017. The City has always been responsive to meeting the needs of the business community with hands-on expedited services, which is reflected in the compliments received at the public counters. Staff anticipates the report will show the lower costs to set up and operate a business in town make it a no-brainer to establish your business in San Fernando. Currently underway in order to make sure that the City is recovering its fair share of the costs for providing certain fee based services in the City while maintaining competitiveness with surrounding jurisdictions to attract and retain businesses. City staff expects an initial draft from the consultant in the first quarter of 2017. Held on Tuesday, January 24, 2017. The San Fernando Chamber of Commerce in collaboration with the San Fernando business merchants, the City of San Fernando, the Los Angeles County Board of Supervisor Sheila Kuehl’s Office, the Los Angeles Economic Development Corporation, and the Valley Economic Alliance held a successful business outreach and networking event. The event included more than 80 attendees that heard presentations on such topics as: internet marketing, building a “cool” website, access to capital, business coaching, making a connection with Chamber representatives, and learning how to do business with the City of San Fernando. The City co-sponsorship was consistent with the long-term economic development efforts of the City to provide resources to existing business in order to help them thrive. The event also demonstrated an enhanced partnership with the Chamber, Mall Association, LAEDC, VEA, and City to attract new businesses opportunities to the community. The City understands our responsibility as stewards of the community’s financial resources and the need for greater transparency as to how those resources are used. In order to demonstrate the City’s commitment to transparent government and open communication, the City has included the City budget and expenditures on its new website that can be accessed and downloaded by the community. On June 25, 2014, the City Council approved J.C. Penney’s Building Mixed Use Project, a multi-million dollar project within the downtown area. To date, no building permits for construction have been submitted to the City and the project still retains its existing entitlements issued in 2014. The project approval allows for the construction of a new four-story mixed-use development with three floors of residential with 101 one-bedroom residential units that will be designated for rent to low-income households making 60% or less of the Los Angeles County Area Median Income; which includes incomes up to $41,700 for a two-person household. The three floors of residential will be constructed above a first floor with approximately 17,455 square feet of commercial floor area dedicated for street level retail/service uses at the subject property located at 1140-1148 San Fernando Road. The project includes 108 on-site parking spaces located within one subterranean parking level and a portion of the ground floor. Retail storefronts will wrap the building along San Fernando Road, San Fernando Mission Boulevard, and a large portion of Celis Street. The project will result in the preservation of the J.C. Penney’s Building’s front façade (along San Fernando Road) and the historic signs. The project allows for Transit Oriented Development consistent with the City’s Corridors Specific Plan, City General Plan Land Use and Housing elements, and the long-range regional growth plans identified by the Southern California Association of Governments (SCAG). Furthermore, the proposed project will also be consistent with the potential development of the Metro’s East San Fernando Valley Transit Corridor Project and associated bus rapid transit, light rail transit, and/or new transit station within the downtown area. The City of San Fernando continues to evaluate and seek new opportunities to work with other agencies, and non-profit organizations through public-private partnerships that provides needed resources to protect the public health, safety, and general welfare of the City and the County’s homeless population. To this end, the City has participated in the Mayor’s Regional Summit to Combat Homelessness on March 31, 2016, were staff met and establish lines of communication with representatives from the Housing Authority of the County of Los Angeles. Locally, City Code Enforcement, San Fernando Police Department personnel and representatives from the County of Los Angeles Department of Public Health have conducted field surveys/outreach in the City. In areas where we have found homeless people, County personnel have conducted field assessments and provided referrals for social services to homeless individuals. The services being made available through our County partners are voluntary. Last but not least, the City Council issued a letter of support on May 16, 2016 to the local San Fernando Community Health Center in order to facilitate their opening of satellite facility to provide medical and housing services for the homeless in the neighboring community of Mission Hills. The satellite facility provides another referral location for homeless individuals that are in need of housing and medical assistance. The City continues to work for greater coordination at a regional level between the County, municipalities, metropolitan planning organizations, and the various council of governments to create a comprehensive planning effort to allocate resources and address the existing needs of our homeless population. On January 17, 2017, the City Council approved the sale of the Lopez Villegas House to Gerardo Jerry Ascencio (owner of San Fernando Realty). Mr. Ascencio intends to move, rehabilitate and preserve the City historic landmark at 613 O’Melveny. Work is currently underway to stabilize the building for the upcoming move, which should take place in the coming months. Once relocated, the Lopez Villegas House will be rehabilitated in order to be used once again as house. The relocation of the house will also create a new economic development opportunity at the City-owned lot where the house was being stored (1320 San Fernando Road) as that site will now be free and clear for the City Council to consider a future use. 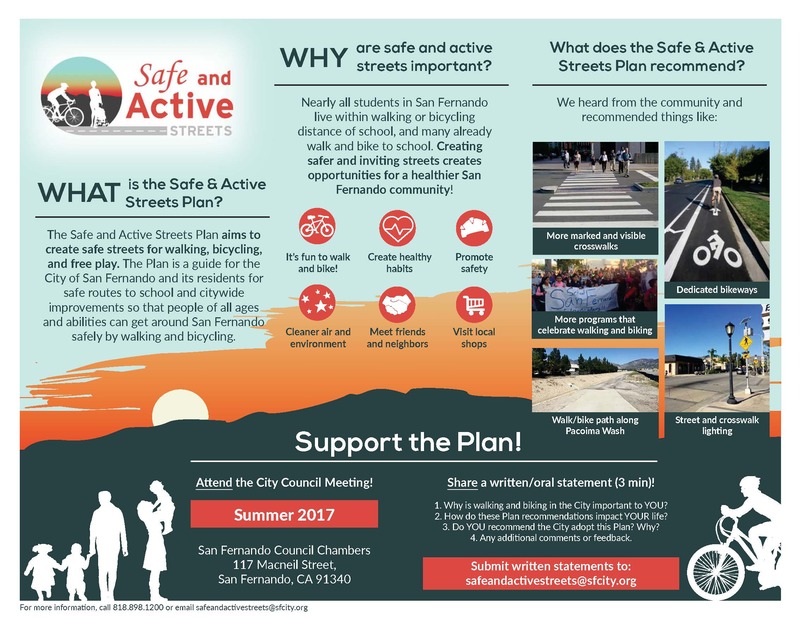 In 2018, the City will host the Healthy San Fernando Open Street Event, which results in exclusive bicycle and pedestrian access to approximately 4.5 miles of streets in the City of San Fernando and the neighboring community of Mission Hills in Los Angeles. For one day, bicyclists and pedestrians will rule the streets. 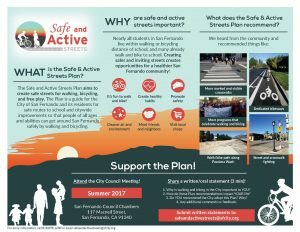 Please look out for additional updates on the City website and bring your family and friends to enjoy bike rides and walks along our streets with your fellow Fernandeños. As you bike or stroll down the streets, there will be different events and locations providing activities and information that promote bicycling, walking and other healthy modes of transportation and recreation. The event is anticipated to draw 10,000 participants. Over the past three years, the City has been the recipient of over $300,000 in State of California Housing Related Parks Program Grant Funds to make needed improvements to City park facilities. These State grant funds do not have to be repaid and facilitate well-needed improvements to our City parks. Over the past two years, these funds have been used to make the following upgrades at Recreation Park: purchase and installation of HVAC’s for gym facility, outdoor exercise equipment, new playground flooring, ADA doors, park signs, benches, and water fountains; totaling $188,050. Starting mid-2017, the City will use $113,650 of the State funds to upgrade the irrigation and drainage systems, provide new playground and flooring, fencing, and add ball field lighting at Layne Park. City Recreation and Community Services staff is currently working with RJM Design Group to develop a comprehensive vision for park and recreation programs in context with their location, resources, and visions of the community. The ultimate goal is to build a framework for City park and recreation programs for the next 15 to 30 years. The plan is expected to be completed by January of 2018. On November 21, 2016, the City Council voted to direct City staff and the City Attorney’s Office develop regulations to address rent stabilization, just eviction provisions, and dispute resolutions between landlord and tenants. Per City Council direction, the City has begun the process of developing regulations that would potentially limit rent increases to one increase during a twelve (12) month period with initial rents established on lease and/or similar agreements negotiated between the Landlord and Tenant. In addition, the new City regulations would outlining what is a permitted “just eviction” consistent with applicable state and federal regulations as well as outlining what are “unjust evictions” and the legal repercussions for landlords that initiate these unjust evictions. These regulations would provide renters and owners with a process to attempt to resolve rent increase disputes. It is anticipated that these regulations would be available for City Council consideration in the second quarter of 2017. The City is actively working to repair our local streets. In 2016, the City Council approved a financing measure to utilize its local, Measure R funds today in order to accelerate the repair and replacement of local streets. This program will fund street repairs under an expedited schedule and help the City achieve economies of scale by combining smaller road projects together and reducing contractor mobilization and materials costs. The City has made great progress on a Safe and Active Streets Plan for our community. The Master Plan is entirely grant funded and incorporates the input of local school officials and stakeholders to ensure that our community infrastructure is safe and provides opportunities for walking/bicycling. Over the past six months, several important items have been completed, including coordinating a successful “Walk to School Day” event and hosting several interactive design charrettes at school campuses. The project team is working on compiling this information and developing recommendations to improve our local infrastructure. In the next few months both the Transportation and Safety Commission and the City Council will review the Master Plan and recommendations prior to it being finalized. The City continues to take an active approach to the maintenance and operation of its sewer system. This includes sewer cleaning, television inspections of sewer lines, regular maintenance functions, and flow monitoring to analyze sewer flow data. Most recently in Spring 2016, 12 flow monitors were installed over a two-month period at several locations in the City. Six monitors were installed in areas where wastewater flows in to the City of San Fernando from the City of Los Angeles while the other six monitors were installed within San Fernando (see map with locations). The location within the City with the highest observed average sewer capacity was found in Basin 3 (the southern portion of the City), with an average flow of 28% of the pipe’s full capacity (0% would mean no flows and 100% would mean full). The location within the City with the highest observed maximum sewer capacity was found in Basin 3 (the southern portion of the City), with a maximum flow of 48% of the pipe’s full capacity (0% would mean no flows and 100% would mean full). Transform the Downtown area into attractive, livable, and economically vital places that better represents the quality and character of San Fernando, conveying the sense of uniqueness, pride, and community spirit that differentiates San Fernando from other nearby communities. Enable the creation of a walkable, mixed-use, multi-modal environment that accommodates job centers, housing and offices within walking distance of both the Sylmar/San Fernando Metrolink Station and Downtown San Fernando. Encourage housing in areas of the Specific Plan that are a ½ mile distance of public transit including the Sylmar/San Fernando Metrolink Station, subject to a Conditional Use Permit. Stay true to the Specific Plan’s goals of transforming the Planning Area’s streets into attractive, livable, and economically vital places that provide a more comfortable environment for pedestrians. Provide design standards that will create a harmonious transition to the single-family neighborhood to the north of the Corridors Specific Plan Area, up to Second Street and west of Maclay Avenue. Accommodate the new transit initiatives proposed by the East San Fernando Valley Transit Corridor Project in a way that does not compromise pedestrian comfort or negatively impact adjacent businesses. 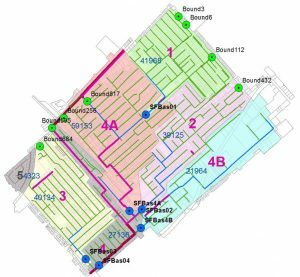 Adjust Specific Plan sub-district boundaries so that certain buildings that are currently legal non-conforming uses fall within a new sub-district that allows the use by right. Update the Specific Plan to put the City of San Fernando in a better position to compete for new funding sources, such as grants for transit-oriented, and public realm improvements. Create a predictable regulatory environment that encourages property owners and developers to invest in new residential, office, and commercial buildings that are consistent with the community’s vision for San Fernando. In addition to the Specific Plan update, an EIR has been developed to assess any environmental impacts resulting from the proposed zoning update and amendments to the City General Plan. The EIR evaluates potential impacts to the environment, including the city’s public infrastructure and emergency services. The San Fernando Corridors Specific Plan Amendment and EIR are available for public review on the City’s website and at City Hall, County Library, and Las Palmas and Recreation Parks. The City has recently hosted a public workshop on August 28, 2017 and a second public workshop is scheduled for 6:00 p.m., September 15, 2017 at Recreation Park. The actual amendments to the Specific Plan and the EIR will be considered by the City Planning and Preservation Commission and subsequently the City Council in the fourth quarter of 2017. Special Note: On May 6, 2013, the City Council accepted a Metro TOD Planning Grant Award of $282,392 to prepare the City of San Fernando TOD Overlay Zone Project, inclusive of the a zone code and general plan amendment and associated environmental impact report (“EIR”). CLICK HERE to view public meetings and community workshops that were held relating to the TOD Overlay Zone. On June 1, 2017, a joint Community Forum meeting was held to discuss the Vista Del Valle Dual Language Academy School Valet Program. The purpose of the meeting was to learn about the program; provide input on the impact to the neighborhood; and give feedback to help improve the program. Click Here to view a summary of the questions, answers and feedback; view the presentation that was provided; and/or take a survey regarding the program.